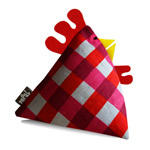 Funky Chicken Doorstops are back! 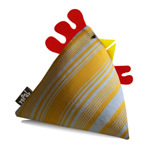 The first time that we came across these hugely popular chicken doorstops was on the nigelecostore.com a few months ago but we are delighted to announce that a larger range of these funky door stops can be found on Refab.co.uk and at a lower price. Looking for an unusual doorstop? Then you won’t be disappointed at all by these colourful doorstops! Their collection includes check, stripe and floral door stops. Nigelecostore are selling these doorstops at £13.25 excluding delivery compared to Refab selling their doorstops at £12 including delivery. Refab also have their own range of draught excluders using bright and floral colors but for those who prefer more subtle colors, there is a jute draught excluder. 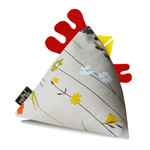 These doorstops are an exclusive design made in England by Refab using quality vintage and reclaimed fabrics. 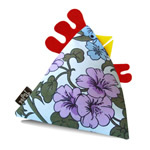 Their chicken doorstops come ‘flat-packed’ making them an ideal gift to send or to treasure in your own home – simply fill with rice and you have a fun and funky way to keep your door open. Packaging: their doorstops come with filling instructions printed on recycled card and a bio-degradable cellophane wrapper from sustainable forest sources. Weight: Approx 1kg when filled.